If you’re looking to sell your home, undertaking some simple improvements can make a big difference to how people view the property. Buying a home is such a big investment, it’s understandable there are things that can put potential buyers off. Topping this list of easily rectified items are things like; mould in the bathroom and a poorly maintained garden. The bathroom can be one of the easiest places to spruce up, especially if you don’t want to spend a small fortune. Cleaning the tiles and grouting and putting in fresh seals can make a tired bathroom look fresh and clean. Replacing an old radiator with a more modern one or switching stained taps for sparkling new ones can quickly change the overall impression of the room. A lot will depend on the age of the bathroom and what needs to be done but simple updates can be carried out with a small budget and a bit of imagination and most are DIY friendly. One area that many buyers focus on is the kitchen as it’s usually the hub of any home. Redesigning and putting in a whole new kitchen will probably be too expensive and you may not get a good return on the investment when you sell. Cupboard doors and worktops, however, are generally of a standard size and can easily and cost effectively be replaced with more modern alternatives. You’ll be surprised what a difference this makes. While wall decorations and paint colour choices are very much a reflection of our personal taste, giving your property a spruce up with a can or two of fresh paint is a simple way to make it more appealing to potential buyers. Try to pick neutral colours which give the place a clean, fresh look. Aim to give an impression of a blank canvass, ready for the new owner to add their own personality to. Most homes have at least one or two issues that need fixing. That could be a spot of damp in one of the rooms or just a broken gutter. If you have an older home, there may be some rather major issues that will need to be addressed. It’s a good idea to have a professional walk around your property and survey what you need to get done before you start viewings. People often forget how their property looks from the kerb and giving the front of house a makeover is important. It’s all about first impressions, so tidying up the front aspect, giving the sills a coat of paint and making the front garden/driveway presentable is a good idea. Filling in cracks, replacing slates and cleaning the windows should also be on your list. If your property has a garden, this can be a big selling point for potential buyers, however, if it is overgrown and unkempt it can just as easily put buyers off. If you haven’t spent much time there recently, now is the time to clear the flower beds, dig up the weeds, remove the old hanging baskets from last year and power wash the decking and/ or patio. Staining the shed and fence panels will also spruce the place up. Of course, there are some more expensive home improvements that you can do, such as replacing the kitchen or bathroom suite. These usually have a decent return on investment but check with your estate agent first before proceeding. The same goes for installing new flooring. However, you decide to prepare your property for sale, try putting yourselves in the buyer’s shoes. 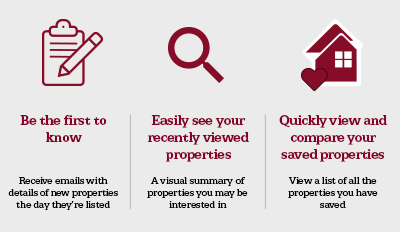 Take a walk round your home with fresh eyes and don’t forget to make use of your Estate Agent, at Northwoods we are always happy to give advice on what we know buyers are looking for and what is likely to put them off your property.